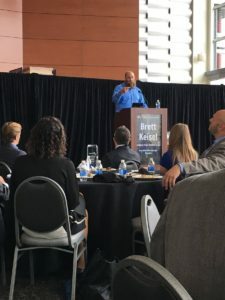 There’s not much difference between a rookie starting out in the National Football League and becoming a startup entrepreneur, and Brett Keisel knows that better than anyone. 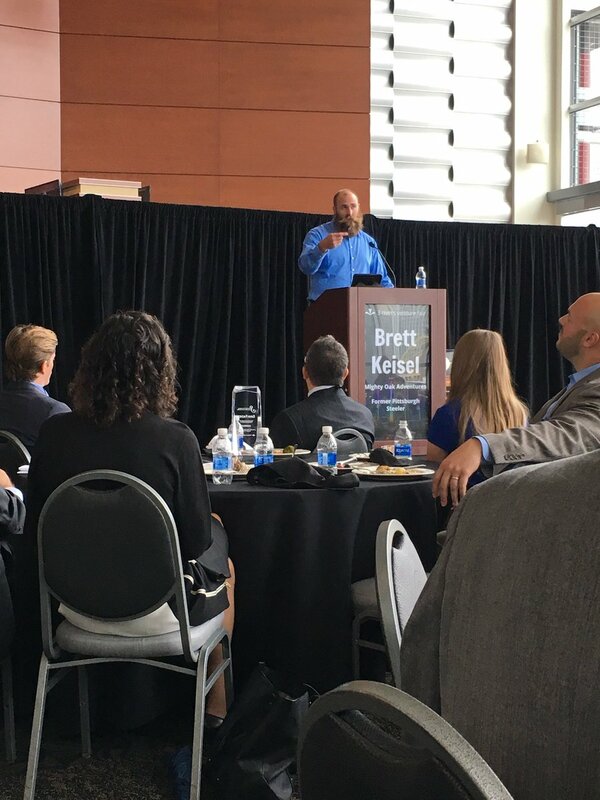 Keisel, the former Pittsburgh Steelers defensive lineman, delivered the keynote speech at the closing lunch for the 3 Rivers Venture Fair on Thursday, stirring a huge extended room of entrepreneurs, investors, academics and others with his down-to-earth tales, humor and casual but boisterous style. The setting, Heinz Field, was certainly a place where Keisel feels at home. “I’ve been here one or two times,” he joked. 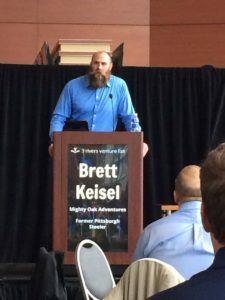 After retiring at age 36 from pro football in 2015, Keisel launched Mighty Oak Adventures LLC last year. The Sewickley-based company serves as an outlet for corporations looking to connect on a different level and boost team moral by providing an outdoor experience that consolidates business, leadership and team building. Coming up with that initial concept drives an entrepreneur, but sustaining it is what makes a winner who will persist through meetings with investors who pass and the bumps and lulls that come with building a business, he said. Success comes down to three things, Keisel said — skill, ability and desire. His idea for his company was spurred by his love of the outdoors and remembering the camaraderie from fishing or hunting with teammates. “I thought, why can’t I do this for other companies?” he said. And while sports fans think of Keisel’s success on the playing field, he remembers his earliest days with the Steelers. 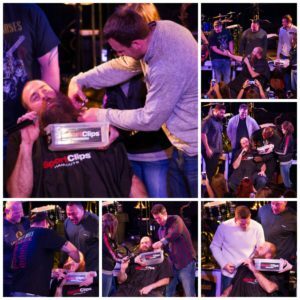 But Keisel toughed it out, and it prepped him not just for his NFL career, but starting Mighty Oak as well. He was working insane hours, figuring out “liabilities, logistics and headaches.” Then a group called and booked an outdoor experience that Keisel slated for Nemacolin and the business was up and running. Photos: Marissa Kuzirian and Richard Lunak.